adiyum padi kadappa – nammAzhwAr says in thiruvAimozhi 4-3-6 “kOlamAm en sennikku un kamalamanna kazhalE” (your lotus like divine foot is like a decoration on my head). In the same manner, AzhwAr says that the earth also donned his divine foot, which he likes immensely, on its head, as a decoration. Alternatively, we can say that the soft divine foot, which the nithyasUris[permanent dwellers of SrIvaikuNtam] wear on their heads, had to measure earth which contains hardened forests and streams. padi kadappa – the divine feet which we had to go and worship, came on their own and measured the earth. thOL thisai mEl sella – the divine shoulders, which would normally be embracing pirAtti (bhUmidhEvi, here), went past the directions. mudiyum visumbu aLandhadhu – the divine crown went till the wall of the universe. The divine crown measured the immeasurable skies [ethereal layers]. Just as great warriors will win over enemies from the same place where they are standing, emperumAn also measured the worlds standing in the same place and won them over. vadi ugirAl IrndhAn iraNiyadhu Agam – emperumAn tore apart the rough body of iraNiyan (hiraNyakashyap). 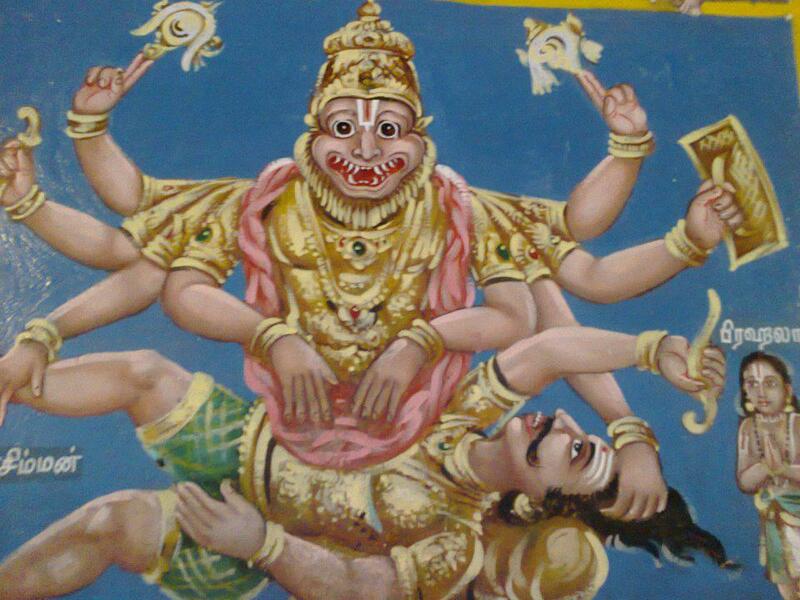 irum siRaip puL UrndhAn – emperumAn is soft and straddles periya thiruvadi (alternative name for garuda)[in our sampradhAyam, hanumAn is called as thiruvadi (divine feet) and garuda is called as periya thiruvadi (huge divine feet)]. ulagu aLandha nAnRu – it is not surprising that I did not get to see emperumAn when he went to annihilate the enemy of his devotee at one place [reference to emperumAn killing hiraNakashyap to protect prahlAdha]. It is not surprising that I could not see him when he went to another place to protect gajEndhra, a devotee [reference here is to the elephant gajEndhar which was troubled by the crocodile]. AzhwAr laments that he lost when emperumAn came, not for one or two individuals, but for all, when he took the incarnation of thrivikrama and kept his divine feet atop everyone’s head. Let us consider the 18th pAsuram next. This entry was posted in iyaRpA, mudhal thiruvandhAdhi on June 26, 2017 by T N Krishnan.